Thanks for following along with my making, doing, and exploring this year. I hope you’re having a cozy and relaxing time with loved ones now. Today, my kids are making the nativity set from madebyjoel. It’s a paper print-out that you can color and put together. Fun times. 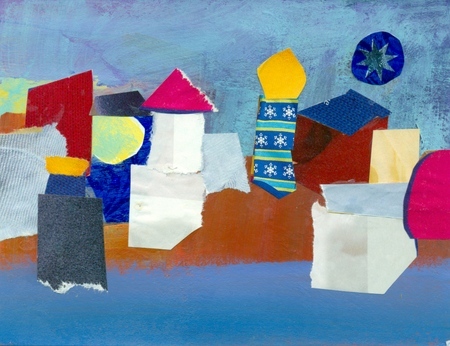 I made this mixed-media collage as a card about 15 years ago. Thought it was time it saw the light of day again. Hope you enjoy, and I’ll see you in the new year. This entry was posted in Art and tagged Art, Christmas, collage by Emily Smith Pearce. Bookmark the permalink.